We are a leading Manufacturer of cable drum lifting jack 20 ton, cable drum lifting jack 15 ton, cable drum jack 10 ton, cable drum jack 8 ton and mechanical screw jack from Jamnagar, India. Provoked to attain and achieve maximum client approval, we present clients with the Cable Drum Lifting Jack 20 Ton at reasonable prices. 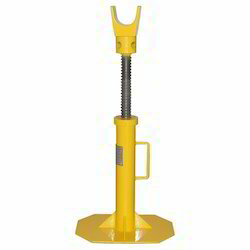 Used for lifting applications, the cable drum lifting jack is known for its capacity of 20 tones. Design for heavy use applications, the minimum drum diameter of these cable drum lifting jacks are 2560 mm. 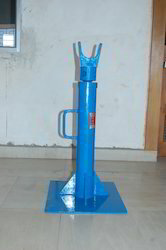 Counted as first among the best, we provide clients with the superior quality of Cable Drum Lifting Jack 15 Ton. Known for its maximum load capacity of 15 tones, the cable drum lifting jack is easy to operate and is used for heavy duty lifting applications. 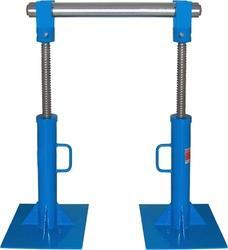 The maximum drum diameter of these cable drum lifting jacks is 2800 mm. Being a market leader of this domain, we present clients with the superior quality of Cable Drum Jack 10 Ton. Known for its load capacities of maximum 10 tones, the cable drum jack has minimum drum diameter of 1960mm and maximum drum diameter of 2500mm. designer for heavy duty use, the cable drum jack-10 ton is fabricated by using latest technology. Matching with the ever-changing demands of our customers, we provide the superior quality of Cable Drum Jack 8 Ton. Designed for providing stability even on the soft ground, the cable drum jack is known for its load capacity of 8 tones and minimum drum diameter of 1660 mm. used in heavy duty lifting applications, the cable drum jack-8 tones are manufactured by using latest technology. Max Machineries provide new range in Mechanical Screw Jack. A capacity of Mechanical Screw jack is 1 Ton – 100 Ton capacity. Idle for Construction, Structural moving, supporting machinery, automotive, trucks, Industrial, Agriculture, General machinery.